After a beautiful calm day yesterday, motoring most of the day, today we got wind on the nose with short steep seas. We are beating into it and going pretty slow but at least we are sailing and it's a nice sunny day. It is getting cooler. I put a fleece on last night for the first time in 6 months. Yom caught some nice chunks of pumice today with the help of the galley strainer. Our progress is good: almost half way to NZ with about 583 miles to go. Is is really 24 shopping days until Christmas? We crossed the official international dateline at 180 degrees last night at about 9:15pm. I watched the GPS as the longitude went from 179 59 999 W to 180 00 000, for about one second, then to 179 59 999 E. Now the longitude is counting down instead of up. We lost the wind at about 2am last night and fired up the motor at about 4am. It's pretty pleasant with a very low swell. 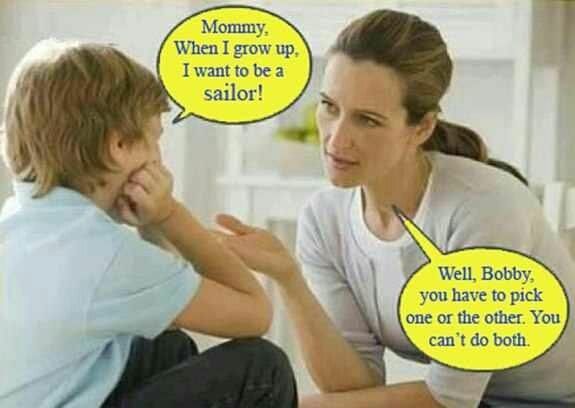 We'd rather be sailing but you get what you get. We can motor for 400 miles total and we have 700 miles to go - you can do the math. Predictions are for a front to hit us around Dec 5th or 6th but it doesn't sound too bad and this morning's prognostications even indicate it might make for a favorable wind. I think I'm going to deploy the fishing line (and hoping that Tom knows how to clean fish). We passed Minirva Reef last night at about midnight. It is actually a seamount 250 miles from Tonga. The reef is circular and four miles in diameter and you can anchor with quite good protection. Three of our friends were anchored but we didn't stop because we had wind and didn't want to waste it (plus it was dark and thus too dangerous to enter). We have been sailing all day at 3 to 4.5 knots. Seas are less than three feet so it's been pretty pleasant. So far we've come 350 miles with 750 left to go. We're hoping the wind gods continue to look kindly upon us. Tom's quote of the day "Come to think of it, why drink Gatorade when I can have a beer?". Since leaving Tonga on Monday (one day ahead of most of you reading this) we have traveled 241 miles and have 854 to go. The sailing was fast and bumpy and wet for the first day and a half. Since then it has mellowed. And now we gliding along at about 3 knots. It's been warm in the day and cool at night (with a nice bright moon). 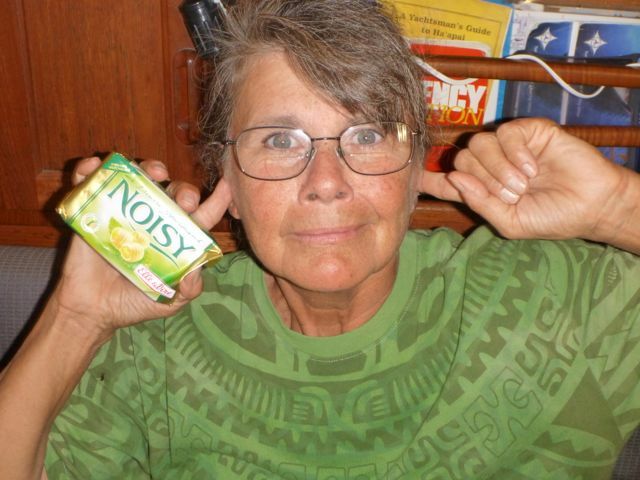 I (Jim) was a bit seasick for the first two day but am feeling better now. Tom is adapting well. This is his first overnight sailing in close to 30 years, but you'd think he does it all the time. And he's a pro in the galley (except when he thought that the French cream cheese was butter and attempted to fry his grilled cheese sandwich in it). There are six other boats out here with us all having left at nearly the same time. We talk every morning and afternoon on the high frequency radio (8131.0 usb) to check in, share weather information, and any other news of interest. The boat Legacy has a book on board on Kiwi culture and they are reading a tid-bit every day. Then the Kiwi couple on the boat Sam confirm whether it is true or not. So all is well from 23:13S, 178:37W. Well, we will be off in the morning (assuming the wind clocks around a little more to the east). We are at anchor just inside the south western entrance to the lagoon here at Tongatapu, Tonga. It's a beautiful night with a cool breeze blowing. The forecast for the passage looks good with no really strong winds or really big seas predicted and not too many calms either. If all goes well we should get to New Zealand in around two weeks. It’s Thanksgiving Day in the US and Friday in New Zealand. Happy holiday! 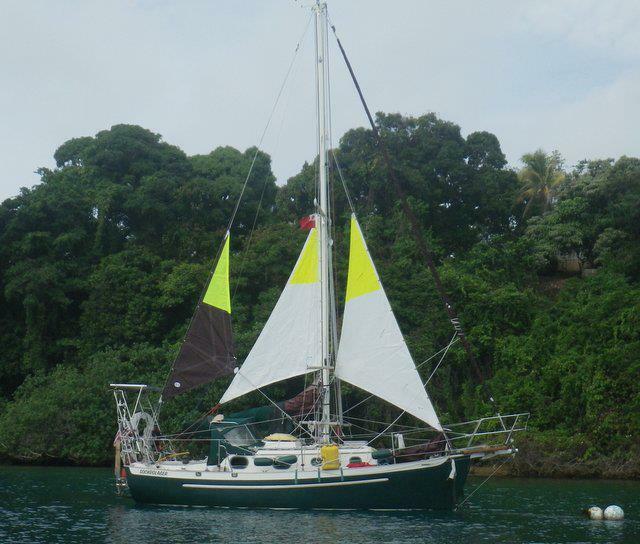 Jim’s friend Tom is aboard Sockdolager in Tonga, and they are ready to sail as soon as the weather window arrives. They plan to leave on Monday (Sunday in the US). The route to New Zealand traditionally starts with making a westing while still in the tropical easterlies, almost to a line north of NZ’s North Cape, then heading south in a good position to catch the temperate latitude westerly winds. Orcinius, Charisma, Buena Vista and other friends are already in Opua; Arnamentiere is nearly there. Now it’s our turn, and though I’m ashore, we’re both hoping for a good, safe, enjoyable passage. Jim plans to head for Marsden Cove in Whangerei. Later today I leave Devonport Auckland to head north, first to spend the weekend with Lin and Larry Pardey at their traditional New Zealand-style Thanksgiving gathering, then further north to Whangerei to await Jim’s arrival. 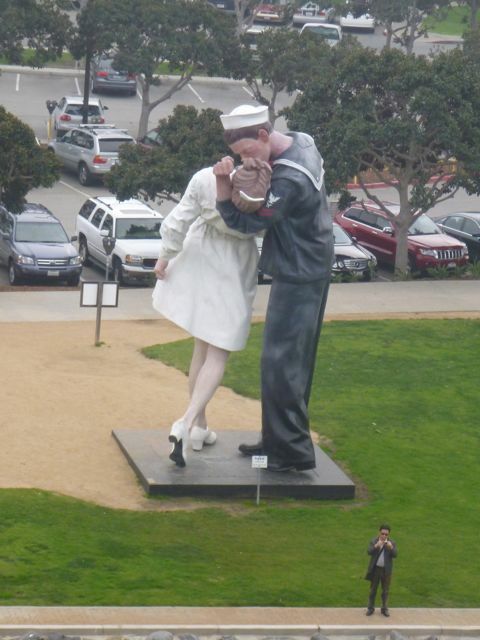 Our Thanksgiving will be celebrated in a couple of weeks with a huge hug and kiss on the dock. Here's Sockdolager all dressed up in her best heavy weather sails: storm trysail, storm staysail, and the new backstaysail. Except for one incident described below, most boats have so far had too little wind rather than too much. We have light air sails to cover that, too. Jim expects the passage to take from 10 to 15 days. You might have noticed an unusual posting on our blog, in the comments section under the previous post. We sure did, and that’s what the rest of this post is in response to. 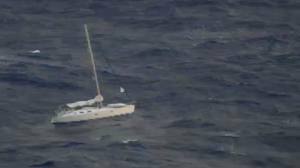 It started with a distress call: The New Zealand Herald’s front-page banner headline on November 10, spread across its full width in giant dramatic letters said “Our three days of hell.” The dramatic rescue at sea of the crew of a sailboat was detailed in the story, and it’s clear there were some heroes that day. That's an EPIRB (emergency position indicating radio beacon) above. They're registered in a database that has the owner's and crew's names and a description of the boat. When it is immersed in water or you manually flip the switch, it beams a signal to a satellite, which is received by the SARSAT network in the US, which immediately contacts the nearest country's rescue agency. It's fast; within 40 minutes help can be on the way. You don't turn this on unless you are in real trouble, because in addition to the likely abandoning of your boat, rescues are expensive and mostly taxpayer-funded. When a distress call goes out on the high seas it’s assumed that everyone will do what they can to help, because among the things shared by long-distance voyagers is a camaraderie that rivals the Thin Blue Line when someone’s in trouble. It’s personal out there. These are people we all know, or know of. So when a distress call goes out, cruising sailors listen to their radios, ready to relay transmissions if needed; they volunteer for organized search and rescue missions; they pray for the safety of the crew if there is nothing else to be done, and they help organize post-trauma care ashore if it will be needed. And if anyone is at sea near the stricken boat (“near” being a relative term out there,) they will turn around and go to their aid, even if it means putting their own boat and crew at great risk. 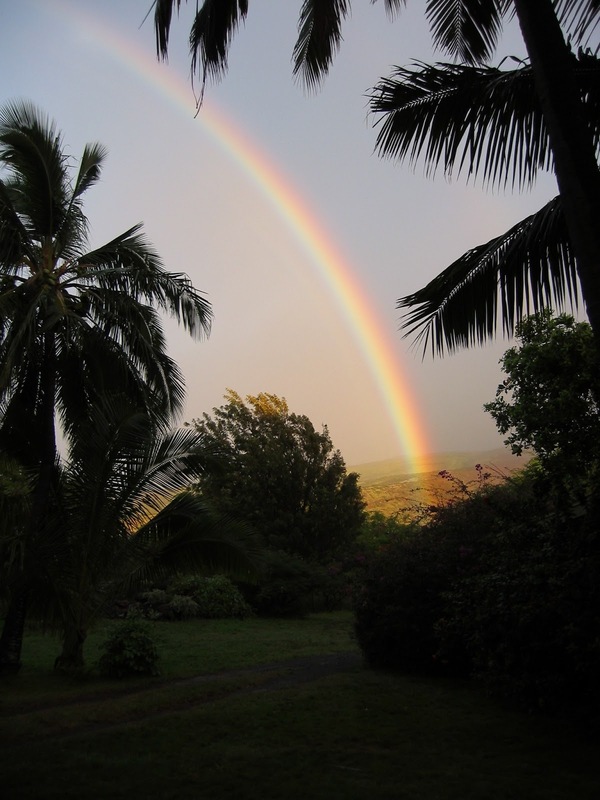 Such was the case in early November, when the season’s first tropical storm, with 60 knots and 11 meter seas reported offshore, struck the area south of Tonga. Jim was safely at a mooring in Vava’u, as were dozens of other boats, some of which had even returned from sea. 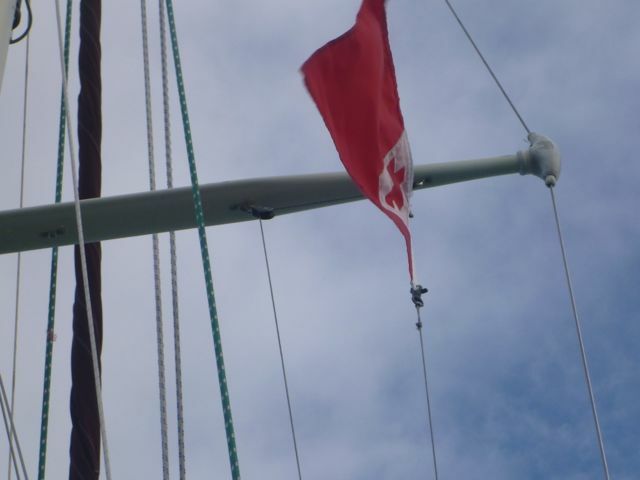 An EPIRB signal was received by the NZ Navy, from the 11.6 meter Beneteau yacht Windigo. Aboard was a couple, a Kiwi woman and a British man who had been living in Australia. They were bound for New Zealand. Somehow a message got out that their boat had been rolled, and they were injured; both had head injuries, and the man had a back injury. This sounded serious. The yacht was also reported to be sinking. An EPIRB can't send this kind of detail, so they must still have had a functioning radio. An Orion search plane from New Zealand circled overhead, dropped them a life raft and took some video footage; a cargo ship was diverted, and the sturdy double-ended yacht Adventure Bound, with a Tasmanian couple aboard, managed the extremely risky maneuver of turning around in 30-foot seas to steam back into the teeth of the storm for at least 24 hours, to stand by for another 24 offering assistance. According to reports, the Windigo crew had strapped themselves in the stern area to keep from being battered as the boat tossed, and would wait until the last minute to enter the life raft. The news reported that it was too rough to attempt a transfer to another vessel. We all were beaming them strength and the will to go on. When a yacht rolls, which means it goes through 360 degrees and is upside down at one point, the forces are tremendous, and it’s very unusual for the mast and rig to survive it. The rig usually breaks, and the entire deck and cockpit area get washed clean of most gear. Often the cabin superstructure is damaged too, and the boat is swamped with water that pours in through any openings, no matter how small, during a rollover. Beneteaus are not known for exceptionally sturdy construction standards in either hull or rig, so it seemed a miracle that the crew was able to transmit a message from their radio about their condition, given that the radio’s antenna is usually part of a boat’s rigging and would likely have been lost. Jim and I discussed this on the phone, exchanging pieces of information we’d gleaned, him from listening to the single sideband radio and me from news reports. We were very happy for that crew to have had this astonishing piece of luck. We never met this couple but I remembered Windigo because the name is shared by a legendary racing yacht I remember fondly. She was moored near us in Bora Bora, along with Adventure Bound, whose crew we met and enjoyed a pleasant conversation with. So, when I saw the video news footage of Windigo with her mast intact and mainsail and genoa still neatly furled, and floating on her lines in a condition that no one could call sinking, I was again amazed that so little damage was evident. The news programs reported that once the seas began to calm a bit, the couple was able to motor their yacht over to the cargo ship, and footage of them being hoisted aboard was dramatic. They looked shaken, and I assumed they must have been badly injured to abandon their yacht like that. The news media did not say what had become of the yacht other than “left to sink.” I assumed, mistakenly, that this couple had made the ethical decision to scuttle and sink their boat by opening the seacocks, because they had to know that nearly 40 other boats were still in Tonga and would be making that passage along the same route. The news clip of this couple arriving in port a few days later surprised me. I had been expecting to see two injured people being helped down the gangway of the cargo ship. What I did not expect to see was a woman kicking up her heels and whooping it up as she approached the camera. Later it was reported that the injuries had not been serious. The camaraderie mentioned earlier comes with some assumptions. It’s assumed that boats that have gotten as far as Tonga know a thing or two about offshore passagemaking, which boils down to a certain basic level of competency and prudence and acceptable risk. It is assumed that if you take to voyaging across the high seas that you are self-sufficient, carry enough safety equipment, and will only call for help if help is truly needed. I can't question the Windigo couple’s decision to call for help and abandon their boat, because I wasn't there and cannot say how bad conditions were. A few days later, this now-rescued couple, or a friend of theirs, it’s not clear to me, posted a comment on our blog beneath the “Still Asunder Down Under” post. We have no idea how they found our blog. They asked Jim to please keep a lookout for their boat, and asked him if he can get close enough to it, to go aboard and close the hatch because they are concerned about water getting in. Let me repeat this: they are concerned about water getting into their boat. In the comment they said that the engine, rig and sails are in excellent condition (read the comment for yourself if it’s still there) but that the batteries are probably dead because they’d left the engine running after they abandoned the boat. Think about that. They could have saved the batteries for lighting the boat so others might see it at night—LED lights can last for a long time—but they chose to step off the boat with the engine still running, the seacocks closed so it wouldn’t sink, and evidently no thoughts for the safety of others. A young friend on another boat about to sail this route hopes to spot Windigo so he can sail it back to NZ for them. That would be a great kindness. You left an unlighted floating hazard directly in the path of dozens of your fellow sailors. You assumed that they can either spot it in daylight hours, or that at night they can avoid colliding with it. You abandoned your boat when it seemed by your own admission to be perfectly able to sail and motor toward its destination. You had a responsibility to practice good seamanship, and you shirked it, and now it’s personal, because your boat is directly on the route of our boat and others, and all you can think of is how to get yours back undamaged. You are not heroes. You did not deserve a hero’s welcome on your arrival. Adventure Bound is the hero, slipping into port after hand-steering for hundreds of miles because the seas damaged their steering gear. Yes it’s a big ocean, but you have added needless worry to the lives of our friends and family, and to the crews and friends and families of the other boats crossing your boat’s path. You have added stress by your thoughtlessness, to an already stressful time when I have to be ashore in New Zealand due to unexpected heart problems, watching and waiting and hoping that your boat does not lie directly in Jim’s path in darkness. You should have behaved more responsibly toward your fellow sailors: if you abandon your boat at sea, sink it. We’re thrilled that Tom Reese, Jim’s longtime sailing buddy, will join him in Nuku Alofa to crew for the passage. Takes a lot of worry out of the mix. They’ll set sail for NZ as soon as Tom arrives, weather permitting, around November 21. I’m in Devonport, a quiet suburb of Auckland, New Zealand, still in that lovely little flat overlooking a salt marsh for one more week. 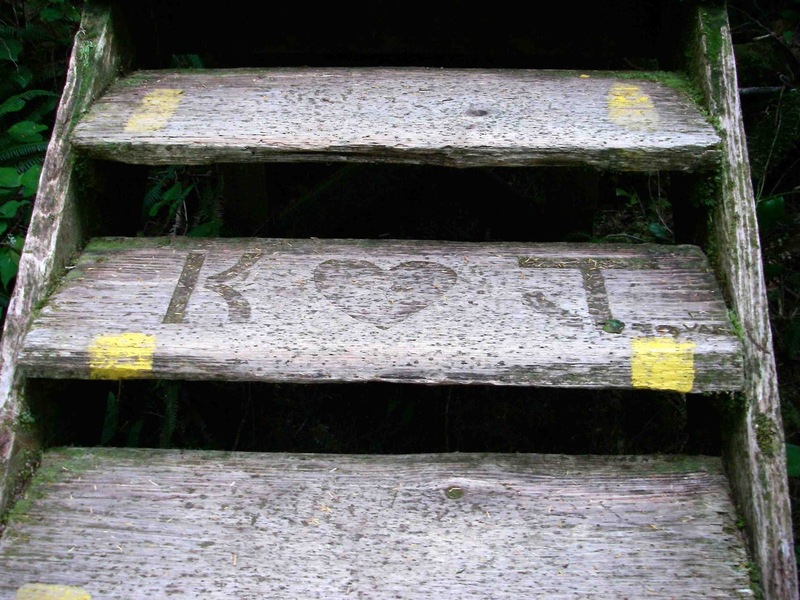 Health matters have improved: The doctor adjusted my heart medication and I have joined a walking group. It’s a little embarrassing to report that although I’m no slowpoke, most of this group’s members, who have at least ten years on me, can leave me in the dust. Must be the air down here, or maybe it’s the rugby, but Kiwis are robust. Walking at a good clip is once again possible in the cool air of a temperate latitude. In Tonga at this time of year, a walk is basically a sweat-bathed slow ooze down the side of a dusty road. Being able to hike here in NZ is nice compensation for not being around all that gorgeous sparkling warm languid turquoise gin-clear, fish-laden, spa-like, inviting, relaxing tropical water... oh, slam a bung in it, Karen. New Zealand is a sightseer’s delight, there’s so much variety here. A visit to the Auckland Museum is a good first step. 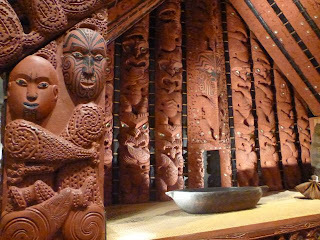 Their exhibits on Maori art and culture are outstanding. 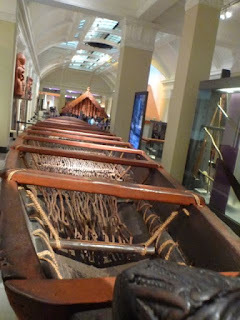 Here is the largest remaining Maori war canoe, Te Toki A Tapiri, built in 1836, and adzed from a single totara log. It’s 25 meters long, can carry 100 warriors, and has elaborate carvings on the stern and prow. It has been in the museum since 1885, and looked so new I did a double-take when I read that it’s 177 years old! The use of woven stick mats to stand on and keep feet out of the water, or allow storage underneath, was brilliant. 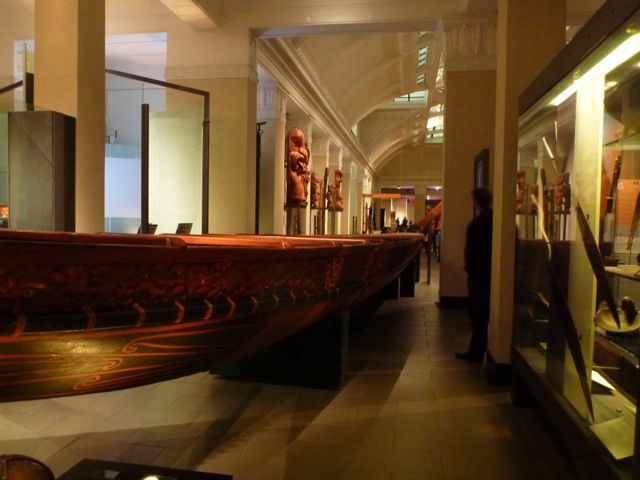 While it would be hard to improve such a canoe, anchor technology has advanced. For such a small country, New Zealand has some interesting wildlife. 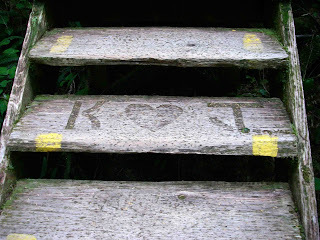 Everyone knows that Kiwis, endemic to New Zealand, are the country's national bird, and we hope to see some in the wild. 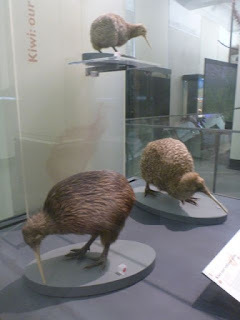 Meantime, here are 3 species of Kiwi in the museum exhibit so you know what they look like. They’re flightless. 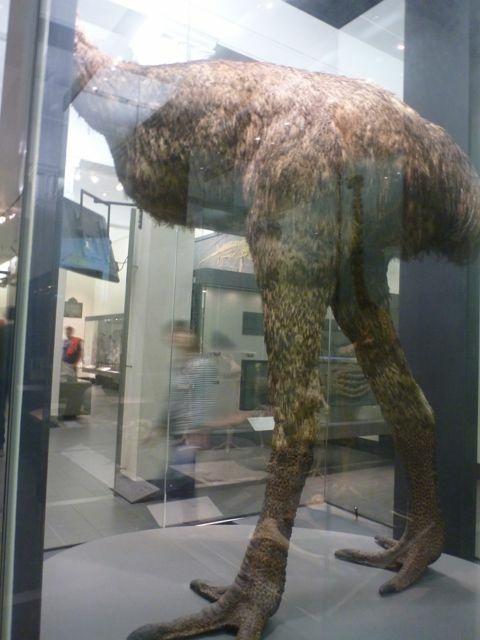 This is a re-creation of an extinct bird called a moa, sort of the wooly mammoth of the bird world. I couldn't fit all of it in the camera lens. 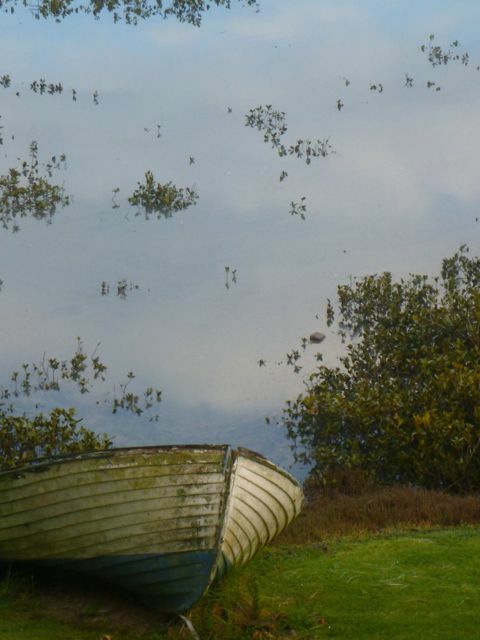 There has been plenty of time for reflection. 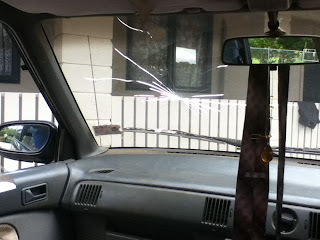 A few of you have asked over the past year what else besides the blog might be coming out of this Excellent Adventure. There have been several more articles published (see the side page for an updated list,) and a whole series on solo sailing is coming out next year in Good Old Boat magazine. Plus, a movie deal with Meryl Streep playing me has been signed… just kidding. But I have begun to put together a manuscript about the Pacific crossing for an e-book, and it’s a fun project. It’ll take awhile to rewrite and edit, but I’ll keep you posted. In the shorter term, reflecting on how we've dropped like little aliens into all these island cultures, with their individualities and quirks and customs, has been enjoyable. Of course, it goes both ways, and I’m sure we’ve been viewed as pretty darned quirky ourselves. 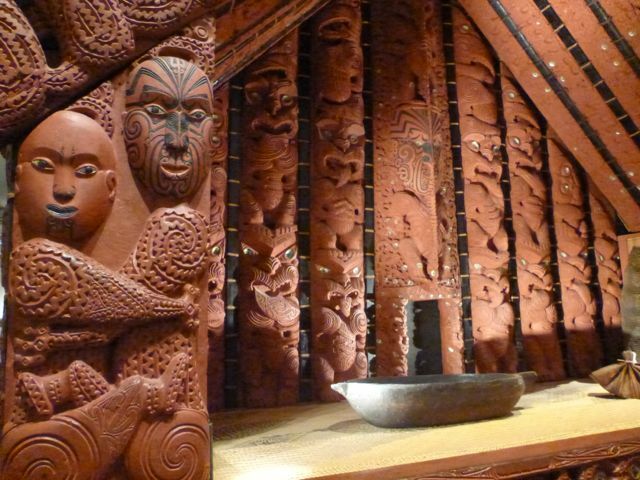 Jim’s hearty attempts at speaking French, Marquesan, Tahitian, and Cook Islands Maori practically guaranteed grins and groans. But we love the eye-opening that this cruise has given us so far. The most profound benefit of seeing the world at 5 knots is realizing that when it comes to basic human decency, people are much the same the world over. There’s something comforting about this, a sense that no one needs to feel aloof or separate from anyone else, that you can wander through humanity and connect with people on the universal currency of a smile. You can talk to someone who speaks a different language from your own and be understood, because 75 percent of what we say comes not from words but from body language. You can ask for help and it will be given, gladly and generously. You can give help and it will be graciously received. You can be awed by the genius of seeing problems solved using low or no technology. You can be abashed at how little is wasted in some societies compared to our own. You can see for yourself that Americans are still liked and respected, and you can look at news stories of far away places with new eyes and think, those are people, not objects. You can be a citizen of the world, and it feels good. It sure beats gated communities. 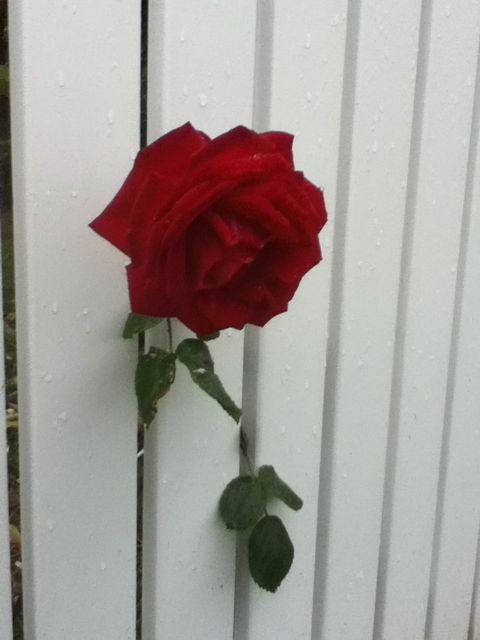 When you spend time in a new place, there is an awareness at first, of things that are different. Gradually this subsides into familiarity, but before it does there’s a pleasant sense of surprise that goes with every excursion ashore. Of course, some observations have hidden messages, like, if your taxi has a windshield that looks like this it might be best to make it a short trip. Where to begin? Ah yes, food. One of the great pleasures of being in a foreign country, besides its people, is its food. Restaurants have long accommodated this, and in rural places local people often put on beach feasts when boats drop anchor. Cooking food underground has been a real revelation ever since we crossed the Pacific; it’s simple, seems to be done everywhere in Oceania, and it makes sense in hot climates. But eventually you have to go shopping, which is also one of the pleasures and challenges of cruising around. Sometimes you have to visit three or four shops to find what you need, and often you don’t find familiar foods. Sometimes it’s the way things are sold; peanut butter at the gas station, for example, or canned chicken at the back of a toddler’s toy store. Some items catch the eye because you don’t know what they are; take ota, the Polynesian voyaging food made from boiled taro and coconut. It looks like a soft fat white hippie candle. Had I known how delicious it was, I would have started snorking it much sooner, but it’s never labeled because it’s home made, and everyone already knows what it is. Except the gringos. Some foods are unusual combinations, like chicken-flavored potato chips. Definitely an acquired taste. I liked Vietnamese shrimp-flavored cheezits, but Jim thought they were so vile he didn’t want me eating them in the cabin. Okay, so shrimp breath mints aren’t the Next Big Thing. 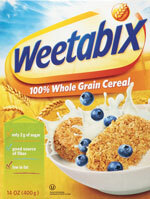 What I don’t get about the brand shown below is the name. 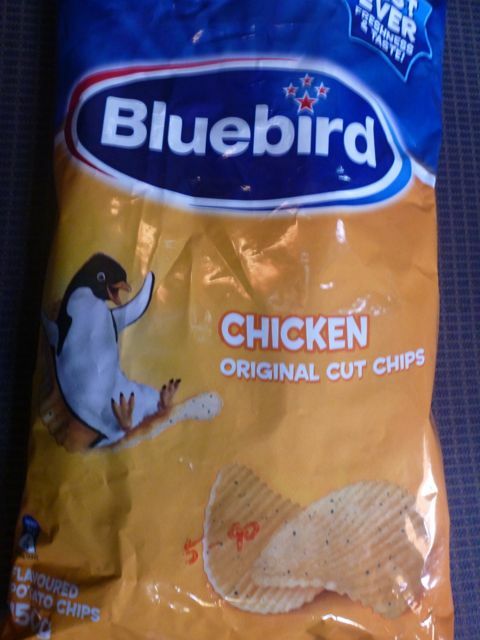 Bluebirds and potato chips? 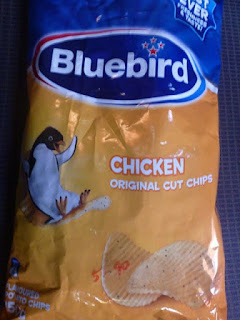 As a former biologist I must also object: that’s not a bluebird surfing a chicken potato chip, it’s a penguin. Here’s the peanut butter from the gas station in Aitutaki. And yes, that’s the price in NZ dollars, about $6 US. Not cheap, but Jim was desperate, and far be it from me to get between a man and his peanut butter. 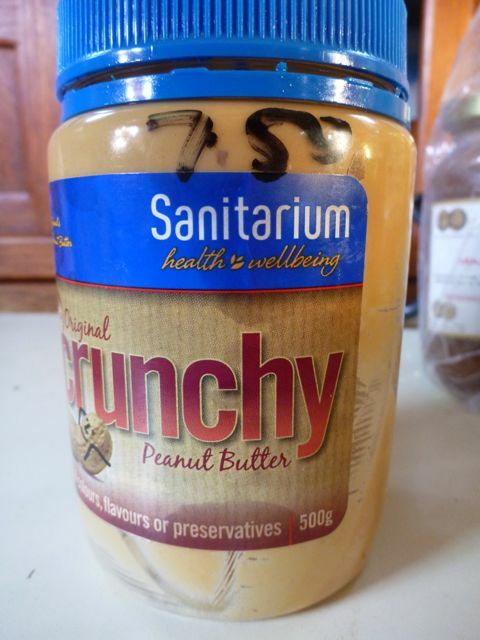 But seriously, Sanitarium? Isn’t that a nice word for, like, sick bay? Granted, the word has hints of “sanitary” and “yum” in it, which you of course would want in your food, and it turns out to be a major brand down here. But I should talk. At home we have “Safeway,” which implies something, but I’m not sure what. Maybe their marketers wanted to distance themselves from the Piggly Wiggly types. 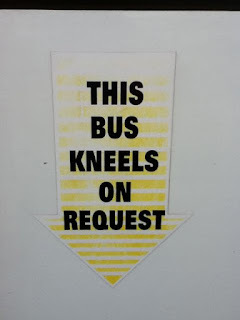 Even the transportation system gives pause for reflection. 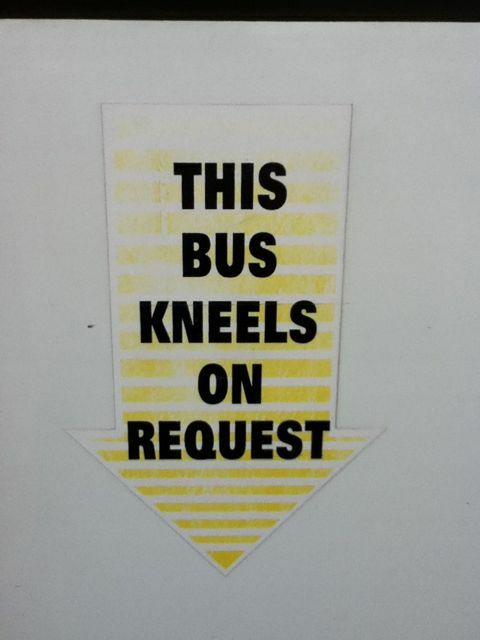 You queue to board the bus, you get this sign. I thought New Zealand was a secular society. Okay, I’m off food for a minute, because we’re going to talk bugs. If you recall from an earlier post, big crunchy bugs are not the kind of thing that make my day. Especially these bugs. 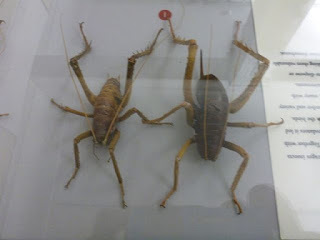 I’m talkin’ major, herkin’ bugs with attitude, so big that according to the museum where I photographed these dudes, even the warlike Maoris feared them. 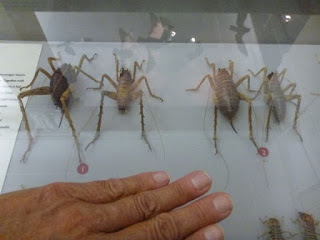 I’m talkin’ Weta bugs, giant ones, weighing up to 72 grams. The world's largest insect. They are almost big enough to saddle, and they live in New Zealand. Like, not too far from here. Weta bugs could run down the Orkin Pest Man and have him for breakfast. And there are several species of Weta bugs! 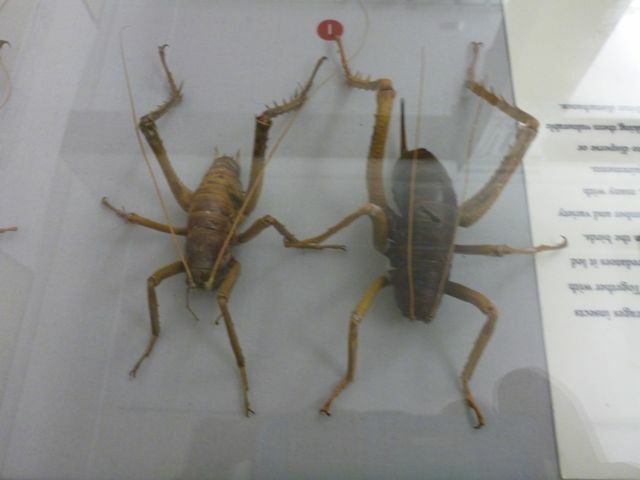 I think the NZ biosecurity folks may have overlooked Weta bugs in the national defense scheme. I mean, think about it. Someone tries to smuggle in a non-native plant or animal, you just put them in a room with a cage full of Weta bugs all wanting to get out. Instant confession. It’s the Kiwi Nuclear Option. If I’d known about Weta bugs before I got here, I would have microwaved my clothes and shoes for extra credit with Customs. Here are some smaller species compared in size to my hand. Thank you for all the emails, comments and good wishes. We love reading them and try to answer everything, but lately with all that’s happened it sometimes takes awhile. After almost two months here in Vava'u Tonga it's time to start moving again. The storm referenced below is over and the boats that were out in it have safely made landfall or are close. The people on the boat that was rolled over and abandoned were picked up by a freighter and are OK. A new wave of boats left here for NZ a few days ago. I listen to them on the ham radio and today most were motoring with no wind! I will depart tomorrow or the next day for Tongatapu, 200 miles to the south, with a stop in the Ha'apai island group. On the 21st my friend Tom Reese arrives from Antarctica, where he has been working for six weeks, to help sail the boat to New Zealand. Tonga is an interesting place and it has been a good spot to spend some time. 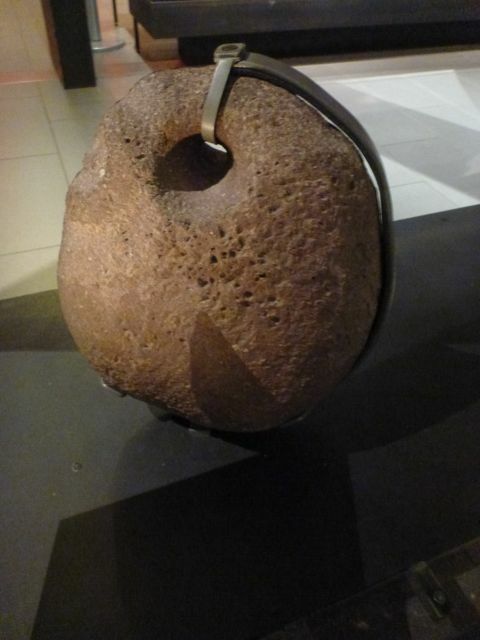 The photo shows the rebar anchor on a small Tongan fishing boat. Jim here. I'm still in Nieafu harbor in the Vava'u group in central Tonga. This is the most protected harbor within in all of Tonga and today it's a very good place to be. 500 miles to the south is the first tropical storm/cyclone of the southern cyclone season, which officially started on November 1st. 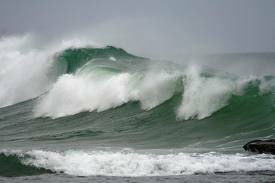 The boats that are already on route to New Zealand are having a tough time. I can listen to them via the ham radio and most are reporting over 30 knots of wind with some as high as 60 knots, and seas of 15 to 25 feet. One boat has been abandoned. The crew is in their life raft and a rescue effort is underway. 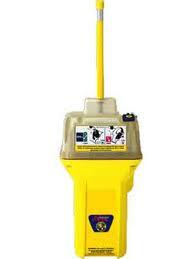 In a separate incident an EPIRB has been activated but no other details on that one are available. A number of boats are hove-to waiting it out. Another boat is reported on the reef within 20 miles of where I am. Here in the harbor it is blowing around 25 knots from the northwest. This puts Sockdolager on a lee shore with trees about 50 feet astern. The good news is that I'm on a very strong mooring and so have little fear of breaking loose and going aground. Last night provided a pretty incredible lighting storm. The harbor which was looking pretty empty a few days ago is now full up with boats that have come seeking shelter from as far as 100 miles away. Everyone here is feeling very grateful not to be out in the storm. It looks like the next weather window to leave for New Zealand will be around Monday or Tuesday, however I will be staying here until around Nov 21st when my friend Tom is scheduled to arrive to help sail the boat to NZ.